Posted on 22 April 2011. The owners of a well-known Mexican restaurant chain have been charged with tax evasion and immigration charges. On Wednesday, federal officials said that this is a part of their campaign to bring down employers who hire illegal immigrants. The Immigration and Customs Enforcement of the United States said that the arraignment for the owners of Chuy’s Mesquite Broiler restaurant will start on Thursday in a Tucson court. Mark Evenson and his son Christopher are facing as much as 19 counts of offenses like unlawful hiring. Joining the father-and-son owners of the restaurant is their accountant Diane Strehlow. 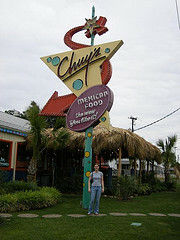 The three defendants were arrested on Wednesday following a series of raids on all 4 Chuy’s restaurants in California and 11 in Arizona. These are all a part of the government’s plan to step-up federal immigration enforcements to stop the hiring of illegal workers. ICE spokesperson for Arizona, Vincent Picard, said that they also arrested 41 people who are suspected for immigration violations during the raids. Most of them will be placed on proceedings for deportation, while some others will be asked to stay to serve as witnesses. The three defendants are alleged to have paid their illegal workers with no payroll taxes withheld or reports to the IRS. The Evensons are said to have knowingly hired undocumented people to work in their kitchens. If proven guilty on all 19 charges, Mark Evenson could face 86 years in prison on top of a $5.33 million fine; his son Christopher may stay in prison for up to 81 years plus an additional fine of $5.08 million; while their accountant Diane will be asked to pay a fine of $2 million in addition to a maximum of 40 years in prison. Monika Pasawana - who has written 87 posts on Your Daily News Fix.